Anyone else inherit the same paranoia about undercooked pork that I did? Do you find yourself perpetually overcooking your pork until it practically crumbles and barely resembles meat? You’re not alone. Overcooking pork is a common practice, stemming from the fear instilled in us by our well-intentioned elders, who warned us never to mess around with undercooked pork. Fearing for our lives and horrified at the thought of contracting some miserable illness, we did as we were told and cooked that pork to a dry 170 degrees. Turns out that nowadays, Trichinella (the parasite of concern in pork) is not so much a problem as it once was. Improved sanitation standards and pig diets have resulted in a much safer pork quality. Furthermore, trichinella is actually killed at a temperature which is much lower than 170 degrees. There’s really no reason to cook your pork to death. The best way to measure the temperature of any meat is with an instant-read meat thermometer, inserted into the thickest part of the meat. If you don’t already own a good thermometer, get yourself one. It is, without a doubt, one of the most useful kitchen tools you’ll own. 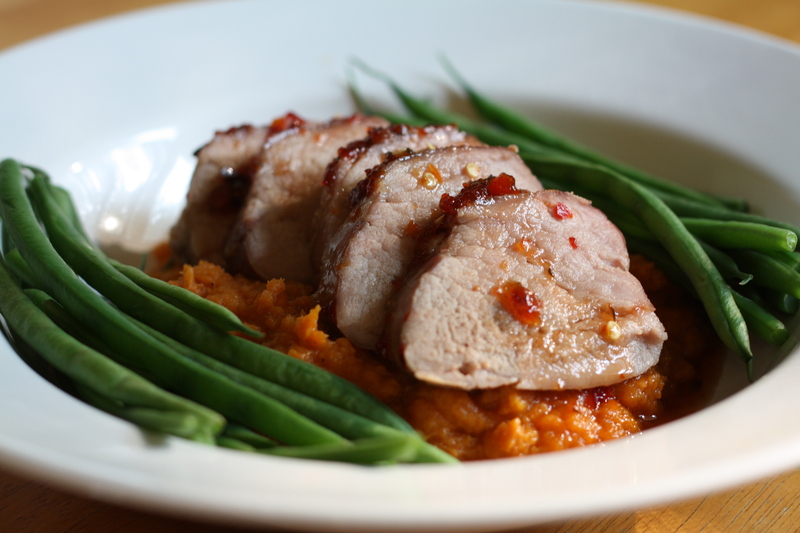 I’ve got just the thing to celebrate the new, lowered safe temperature recommendation for cooked pork; a lean pork tenderloin glazed with a sweet and spicy sauce made of honey and sambal oelek (ground chili paste). 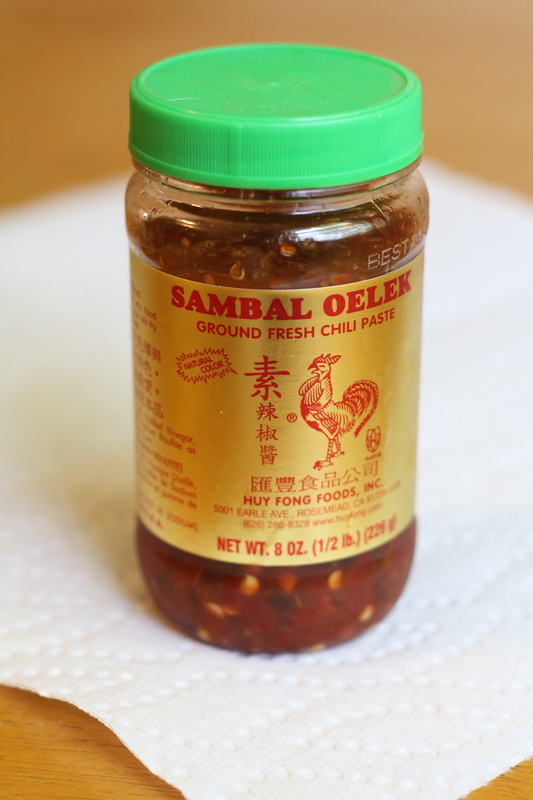 Check in the international section of your grocery store for the sambal oelek. If you’re unable to find it, a ground chipotle pepper (from a can of chipotles in adobo) would make a good substitute. Our perfectly cooked tenderloin will be served atop a mound of lightly spiced, smashed sweet potatoes and drizzled with a bit of the honey sauce. Remove any excess fat or silver skin from the pork tenderloin. Place the tenderloin on a baking dish. Season with salt. In a bowl, combine the honey and sambal oelek until well blended. Pour about half of the mixture over the tenderloin. Place the tenderloin in the oven and cook for about 25 minutes, until it has reached an internal temperature of at least 145 degrees. Halfway through the cooking time, pour the remainder of the honey mixture over the tenderloin. Allow to rest for 3 minutes before slicing. Serve over smashed sweet potatoes. Drizzle with excess honey sauce from the baking dish. For the sweet potatoes: Place 2 large sweet potatoes on a baking sheet. Bake in a 375 degrees oven for about an hour, until very tender. Split the potatoes in half and scoop out the tender insides. Smash the potato with 3 tablespoons of butter and about 1/2 teaspoon of cinnamon, until as smooth as desired. The recommended minimum temperature of 160 degrees for ground meats includes burgers, despite some people’s preferences for a more rare-cooked burger. The higher recommended temperature for ground meat (as compared to whole cuts of meat) is due to the nature of the product. Whereas bacteria exists mainly on the surface of whole meats, which enables it to be fully killed during the cooking process, bacteria in ground meat has the potential to be spread throughout the entire product. If you prefer your burgers on the rare side, your best bet is to purchase the highest quality meat from a trusted source and grind it in your own, impeccably clean meat grinder. Irradiated beef, which has been exposed to radiation in order to kill bacteria and parasites is another option for rare-cooked burgers, though personally, the idea of irradiated meat doesn’t sit well with me. I’d much rather just cook my burgers to the recommended safe temperature. Using a ground beef with a higher fat content (80/20) is the best way to maintain a well-cooked, juicy burger. Posted in Culinary Techniques, Dressings and Condiments, Food, Main Course, Pork, Potato, Recipes, Side Dishes, Vegetable and tagged Cooking, culinary technique, easy dinner, Eating, Food, pork, potatoes, Recipes, vegetables. Bookmark the permalink. Wow- I missed the news on the pork temp lowered! How good to know, thanks for writing this great informative post! I look forward to trying your recipe! Great recipe and tips I stumbled and pinned this! Lovely, flavorful dish. Excellent job. 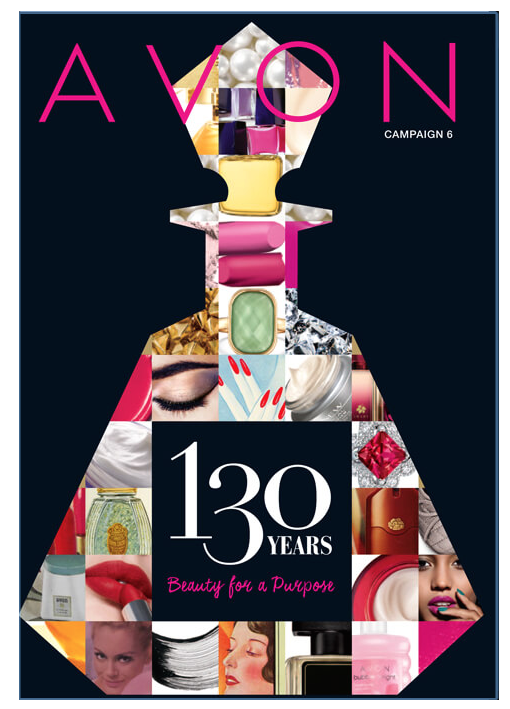 Big Buzz for you! 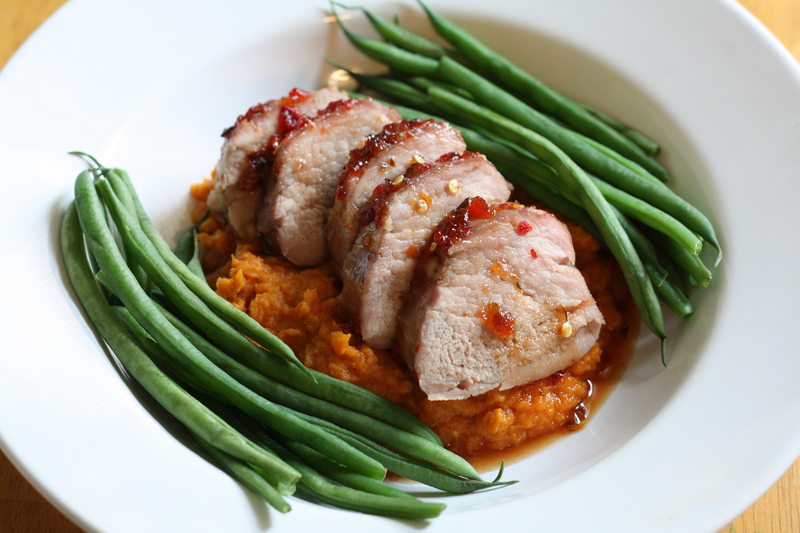 You’ve combined two of my favorites, pork and sweet potatoes. Big Yum!